Future of Mining Americas connects the mining supply chain around the globe to debate the future of the industry and discovery the latest innovations and technologies that are spearheading mine productivity, efficiency and safety. The conference takes place October 29-30 in Denver with dedicated curated content with focus on the themes of Exploration, Development, Management, Infrastructure and Leadership. How will mining be disrupted in the next decade? How will autonomy and technology change our view of the average "miner?" and how will this transformation actually happen? How can the global mining industry collectively work towards a positive culture shift and how can mining companies prepare for the future by developing an agile talent base? The conference is well supported by sponsoring solution providers specializing in operational and digital transformation, analytics, Internet of Things (IoT), Artificial Intelligence, drone solutions and geospatial data collection, including Komatsu, Proudfoot, Riivos, RIEGL, senseFly, Uptake, Hayward Baker and Vrify Technologies. 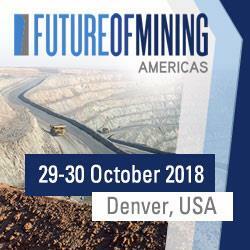 All those with a vested interested in the future of mining can participate from October 29-30 at the Embassy Suites by Hilton Denver Downtown Convention Center, CO, USA.